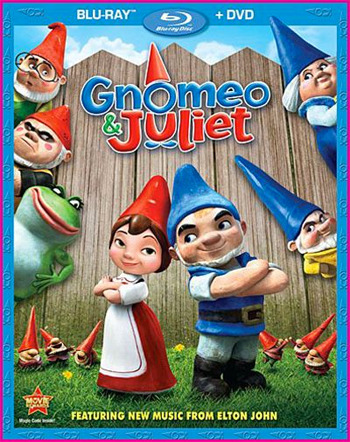 The 2011 animated 3D film Gnomeo and Juliet is a new twist on Shakespeare’s famous romantic tragedy, Romeo and Juliet. The movie hits Blu-Ray + DVD on May 24. This movie, like most animated films made in the past few years, is hilarious, satisfying and worth seeing! Mrs. Capulet and Mr. Montague are two neighbors living on opposite sides of a duplex. They are both very competitive about their colorful gardens and extensive collection of garden gnomes. And they have transferred that competitive nature to their gnomes. While the homeowners are asleep, or out for the day, the gnomes come to life. The blue Montague’s and the red Capulet’s want nothing to do with each other, except when they are racing lawnmowers. But when it comes to friendship and love, their fates are sealed. Blues and reds don’t mix. They are enemies born into an long-lasting feud. One day, the lovely Juliet Capulet spots a beautiful flower in the abandoned yard across the road. If she could get that flower, her family would be the envy of the Montague’s. Meanwhile the handsome Gnomeo Montague embarks on a stealthy mission into the Capulet’s yard. But when he’s nearly caught, he escapes to the abandoned yard. There, by chance, he meets Juliet. They both fall in love at first sight before realizing that their families are enemies. Can they make their love work? Or will their family feud drive them apart? Gnomeo and Juliethas a very similar plot to the original Romeo and Juliet. Well, as a similar as a classic 16th century play and a 3D animated movie about garden gnomes can be. 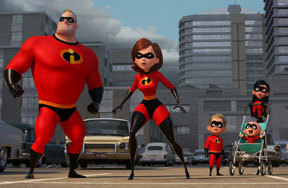 The film is witty, and like most animated films these days, it has humor for all ages. Many famous actors play the voices of the characters, including James McAvoy as Gnomeo, Ozzie Osbourne as Fawn, and Maggie Smith (Professor McGonagall) as Lady Blueberry.